The Contemporary sale catalogues are appearing online for London’s sales in February. As often happens when auction specialists react to previous sales histories, similar works are coming to market to capitalize on strong sales and satisfy underbidders. Both these sales follow the curious sale last year of Hirst’s Lullaby Winter, a work from 2002 that was originally comprised along with three other cabinets in Lullaby, the Seasons. Evidently the seasons were split up because Lullaby Winter was offered at Christie’s in May of 2007 as the Contemporary art market rise, and Hirst’s fame and appeal, were all cresting. The 2007 sale was recorded as $7.4m in New York. Shortly thereafter, in the London sales of June 2007, another work, Lullaby Spring, from the original four Lullaby cabinets sold at Sotheby’s in London for £9.6m which converted to $19.2m on the day. In other words, the price of a pill cabinet tripled in less than six weeks. It was a breath-taking moment on the art market made all the more memorable as rumors circulated the buyers were the Qatari ruling family, the Al-Thanis. Long before the Cézanne Card Players or the Gauguin the family is meant to have paid $250 and $300m for privately, they cut their teeth on a Hirst pill cabinet, among other things. What they, and the underbidders, did not know was that the buyer of Lullaby Winter would fail to pay for the work. Christie’s ended up owning the work. Before they could bring it back to market, the global credit crisis knocked the bottom out of the art market, in general, and the Hirst market in particular. Art ultimately recovered the valuations we saw on many works in 2007 and even surpassed them for particular artists. Hirst, however, hasn’t seen the recovery in prices. Neither have some of his peers. Nonetheless, Christie’s decided last February that holding a work on its books for 8 years was long enough. They offered Lullaby Winter for sale and took a loss. The £3m a buyer paid was slightly above the low estimate and worked out to $4.6m on the day. That’s nearly a $3m loss for Christie’s. After the schadenfreude died down, it probably occurred to specialists at both Sotheby’s and Phillips that sale was a milestone. After nearly 8 years, there was a price in the pill cabinet market. Although it was a price down from the peak, it was still a price and more than half the frenzied days of 2007. If one of the Lullaby cabinets still had a buyer out there, then perhaps there were buyers for other pill cabinets. Working the next level down in that market is smart strategy. Potential buyers see a price above theirs and it should give them confidence. Sotheby’s and Phillips clearly set out to capitalize on Christie’s move. They both seem to have latched onto similar works which are more domestically sized than the Lullaby cabinets. And Sotheby’s has put an estimate on their lot that says the seller will take half of what was paid for Lullaby Winter for a work that is two-thirds the size. 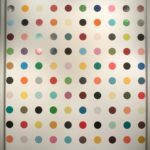 Hirst’s work isn’t well catalogued but the artist continues to add more and more information. It was previously thought that there were about 20 pill cabinets. Hirst’s site now shows 19 pill cabinets made between 1999 and 2010 (there may be more.) At least one work, the Lullaby series has been split up. One other work consists of a pair of cabinets that may or may not be together. Of these 23 pill cabinets, there are seven different sizes of cabinet. Some of the works have identical pills, others have a variety. The works on offer in February happen to come from a series of three pill cabinets made and titled separately but sharing dimensions and the ‘In Search of …’ formulation. The last of the works is In Search of Oblivion (2007). And, yes, these sales may bring the market for these works back from oblivion.